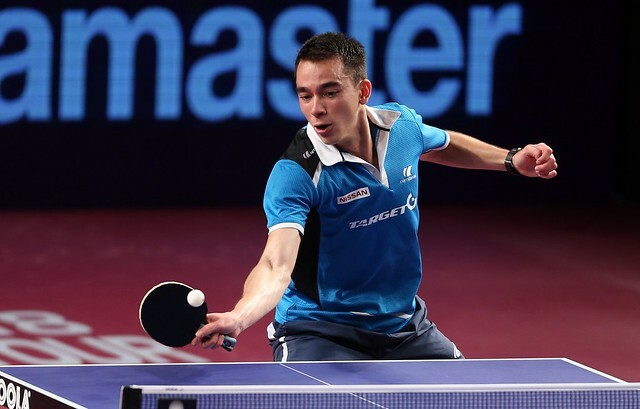 Reigning World champions, the winners just under a year ago in the German city of Düsseldorf, as their pedigree predicted, China’s Fan Zhendong and Xu Xin won the Men’s Doubles title at the Seamaster 2018 ITTF World Tour Platinum Qatar Open in Doha. On the late afternoon of Sunday 11th March they beat Japan’s Jun Mizutani and Yuya Oshima in five games (9-11, 11-5, 11-9, 13-11). A good start for Jun Mizutani and Yuya Oshima partnership was essential; they achieved that good start; they won the first three points of the opening game. Fan Zhendong and Xu Xin recovered to lead 8-7 but the Japanese duo stuck to their task, duly securing the opening game by the minimal two point margin. Success somewhat against expectations, the Japanese duo had no prior record of international success. Immediately Xu Xin and Fan Zhendong responded; they secured the second game with a degree of comfort, before in the third experiencing a host of problems, They trailed 4-8 before winning the next four points to level matters; the next two points were shared before Fan Zhendong and Xu Xin prevailed by the minimal two point margin. Close but the win was crucial, in the fourth game the Chinese duo went ahead 5-2, Jun Mizutani and Yuya Oshima called “Time Out”; Fan Zhendong and Xu Xin progressed to establish a 9-6 lead. Taking no chances they called “Time Out” it was a decision they nearly regretted. At 9-10 they had to save one game point before on their second match point gaining victory. It was for Fan Zhendong and Xu Xin their third ITTF World Tour Men’s Doubles title; previously they had won in 2015 in China and more recently in 2017 in Sweden.